Click here for our New Patient Special Same day appts. avail. Irvine chiropractor. The leading health professionals at Stafford Chiropractic are dedicated to helping you achieve your wellness objectives. State of the art MR4 laser on site! Dr. Stafford is fully trained in treating sports injuries, scoliosis, TMJ, carpal tunnel, neck / back pain and auto accident injuries, and has been helping patients with these symptoms and more for over 23 years. He is considered one of the leading practitioners in Southern California for TMJ. Dr. Rod Stafford is committed to bringing you better health and a better way of life by teaching and practicing the true principles of chiropractic wellness care. Patients seeking treatment at Stafford Chiropractic with Dr. Rod Stafford are assured of receiving only the finest quality care through the use of modern chiropractic equipment and technology. 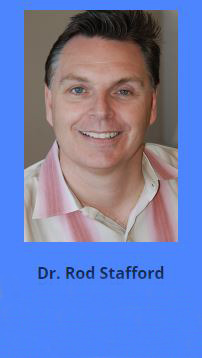 Dr. Rod Stafford and the staff have a genuine concern for your well-being! If you are new to our website, please feel free to discover and learn about chiropractic wellness. If you are interested in starting your journey towards wellness please subscribe to our award winning newsletter. If you are already a newsletter subscriber, please explore the member wellness section of our website for wellness articles, resources, and health facts--specifically targeted by Dr. Rod Stafford to your wellness needs and interests. "Dr Stafford is GREAT! I have been seeing him for over a year and my health has improved tremendously. He has helped me with a plethora of issues - headaches, upper back and neck pain, carpal tunnel, TMJ, rotator cuff pain, numbness in my hands and legs, when previous chiropractors just didn't get it. Dr. Stafford and his staff are extremely professional, courteous and have a great sense of humor. They even provide healthy snacks like fresh fruits, water, mints and cookies from Trader Joes! The office is small & efficient and provides . everything you need for outstanding care." "Your chiropractic procedures, skillfully performed as I must add, had alleviated the tremendous amount of stress that had developed in my muscles and joints during day to day work activities at the office and from my strenuous workouts in the gym. Irvine Chiropractor"
"Thank you for straightening me out!! My back and upper back/shoulders are feeling much relief and so much less pain - then there's my thumbs, almost pain-free and what a bonus! My left foot feels better, too! Thanks for helping my friends, too."